Gold hit new highs at $1224.37 adding more than $35 of gains since the beginning of the week. 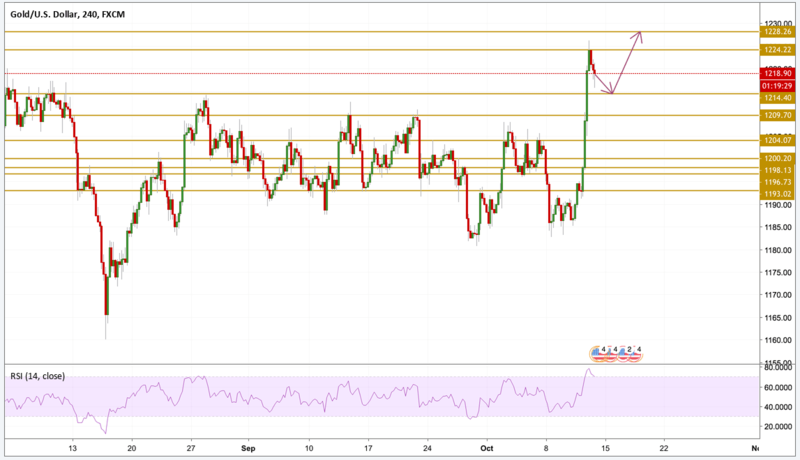 This bullish momentum came after the US inflation report printed below expectations pointing towards a slower US economy which helped the precious metal surge to the highest level in more than two months - getting back its allure as a safe haven. Global equities also continued to add more losses with the DOW index retreating 1378 points so far. At times like this, investors hibernate and watch closely the next move as they wonder whether to buy the dip or wait longer in case of a deeper correction. That is why they choose to protect their cash and the best way to do it is to buy the yellow metal for the moment. After a surreal surge in pries since the beginning of the week, Gold entered into deep overbought conditions so profit taking could be triggered here but there is no slowing or reversal signs at the moment so a retest of the previous range high at $1214, should be enough to inject more bullish momentum in the price to print another high. The next level we will be focusing on is the $1228.3 resistance level.